Tottenham Hotspur face having to play all their home matches away from White Hart Lane for one season. A legal wrangle means they are "highly unlikely" to move into their new stadium as scheduled for 2017-18. The Premier League club may have to find an alternative venue while construction work is carried out. 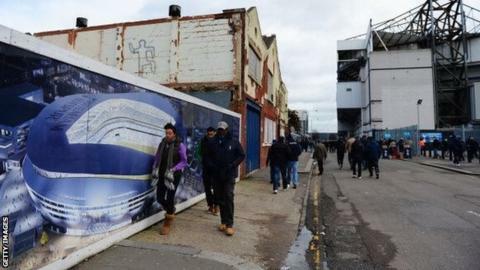 Plans for the 56,250-capacity stadium, next to their current White Hart Lane ground, are being challenged by the landowners. Progress on the project appeared to take a big step forward in July when a compulsory purchase order of land was approved. But a Spurs statement issued on Wednesday said that decision was being challenged in the High Court and the club fear they will not able to move into the new stadium for the start of the 2017-18 season. "The club has revised its construction programme in order to take the shortest possible time to construct," said the statement. "This now therefore involves the club moving away from the Lane during construction for a period of one season, to start at the beginning of a season in order to comply with Premier League rules. "We are currently undertaking due diligence on alternative stadium options." The stadium would be built as part of a development that would also include the land their current home (capacity 36,240) stands on. In 2011, Tottenham lost out to West Ham in a bid to move to the Olympic Stadium in Stratford. The venue - which will be the Hammers' home from the 2016-17 season - is reportedly among alternatives, together with Wembley and Milton Keynes Dons, being considered for the time away from White Hart Lane. But with West Ham established as the prime tenant, it is thought the Olympic Stadium is not a front-runner in the search for a temporary home.